July's IronCupcake:Chicago challenge is "BERRY PATRIOTIC". Your cupcake creations should include one type of berry and be decorated with the colors "RED, WHITE and BLUE". 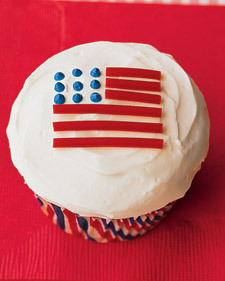 This challenge will be in honor of "GOOD OLD USA", so let's celebrate our country's birthday with "CUPCAKES".